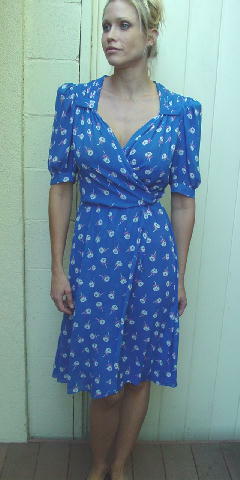 This medium blue wrap dress has half sleeves and mini shoulder pads. The sleeves have 1 1/4" wide cuffs with a dark pink faux pearl button on each. It has a thin elastic waistband. There is gathering extending downward from the front shoulders. 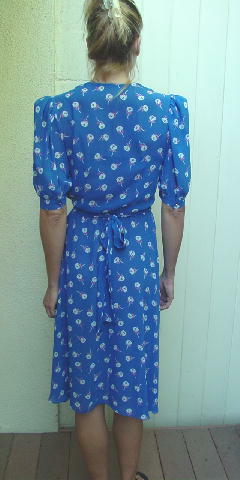 It has two 35" by 2 1/2" fabric ties. The left tie goes through a slot in the right side seam and both ties tie in the back. The front sides angle upward. The left side crosses under 12" at the waist. 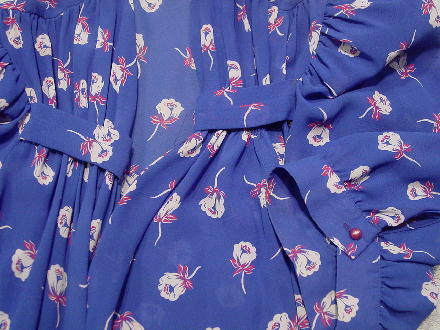 It has a design pattern of offwhite and magenta flowers and leaves. The third picture shows a more accurate color. shoulder to shoulder 13 1/2"
shoulder to hem 42 3/4"